The national economy continues to strengthen, however for the first time in a while, not every economic indicator is rosy. In particular the manufacturing sector has clearly softened in recent months. Much of the slowdown can be directly attributed to the oil and gas industry, where substantially lower energy prices have reduced new investment and employment. While such impacts were expected in the near-term, weakness in consumer spending was not. To a large degree, consumers are saving much of their gasoline-related windfall, resulting in slower sales growth than expected. Given the ongoing strengthening in the labor market, nascent signs of wage growth picking up and the recent weights on the economy being eliminated, this recent slowdown in consumer spending is expected to be mostly a timing issue. Moving forward consumers will not only have the financial wherewithal, but also the belief and confidence to increase their purchases to match the underlying improvement in the economy. Unlike the nation that is growing at a modest pace, Oregon’s economy is experiencing full-throttle growth today. Jobs and income are increasing as fast, if not faster than during the mid-2000s. Given demographic trends, such rates of growth are considered full throttle. As in past expansions, Oregon has regained its traditional growth advantage relative to other states. Much of this advantage can be attributed to the state’s industrial structure and strong in-migration flows. 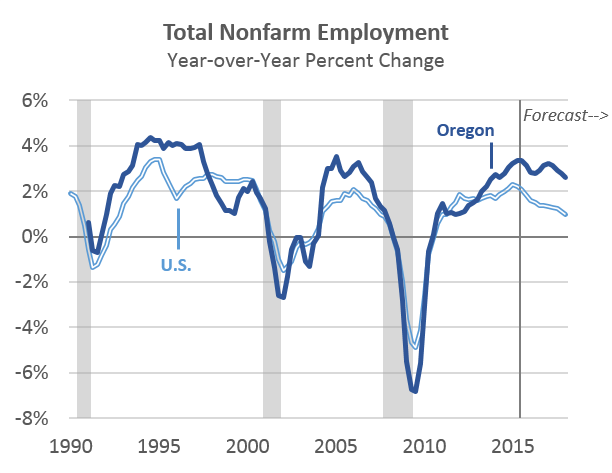 More important are the indications that Oregon is seeing a deeper labor market recovery. Wages for the average Oregon worker are increasing quicker than in the typical state, and the labor force is growing. While growth rates, and the trajectory of the economy have improved considerably, Oregon is not yet fully healed from the Great Recession. The state’s labor market is nearly two-thirds of the way back to pre-recession levels and should reach full employment over the course of the upcoming 2015-17 biennium. After which time, net growth rates are likely to slow significantly over the longer horizon as the Baby Boomers fully age into their retirement years. Growth in Oregon’s General Fund revenues has been very rapid this fiscal year, rivalling the gains seen during the technology and housing booms. Gains have been broad-based across Oregon’s primary revenue instruments, due both to a healthy job market as well as to solid growth in taxable investments and business income. Even lottery sales, which have been relatively dormant for years, are now expanding at a solid clip. As expected, the personal income tax filing season turned out to be a big one for revenue collections due to large gains in reported business profits and investment income. Realizations of capital gains nearly doubled on the year. 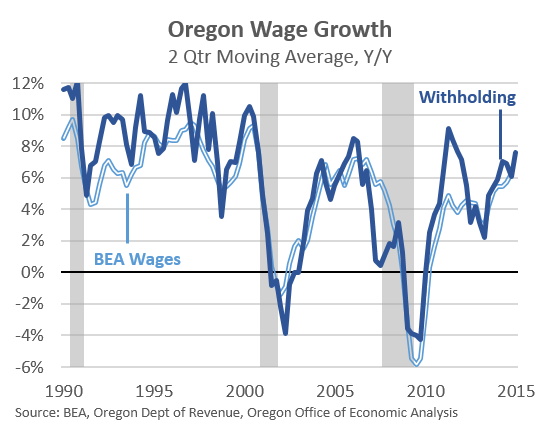 While the big April filing season was expected, the full impact of Oregon’s rapid job gains and wage growth was not. As a result of booming labor-related income tax collections, it is now highly likely that a personal income tax kicker payment will be triggered at the end of the biennium. The May 2015 outlook assumes that revenues included in the personal income tax kicker base will exceed the kicker threshold by $182 million at the end of the biennium. Should this outlook hold true, a personal income tax kicker of $473 million will be generated. Due to actions taken by the 2011 Legislature, this potential kicker payment will take the form of a credit on 2015 tax returns rather than being issued as a check at the end of the year. Despite the larger expected kicker payment, the May revenue outlook now calls for a significant increase in available resources for the upcoming biennium. Widespread optimism is now being voiced by a diverse chorus of local businesspeople and economic forecasters. This optimism has been translated into increased expectations for job growth and taxable wage gains. The March 2015 forecast was an aggressive one, calling for job gains over the upcoming biennium matching the best two years of the housing boom. Even so, business sentiment in Oregon has become so bullish that a strong majority among our office’s advisory group members pushed for significantly more growth to be added over and above what was assumed in the March forecast. Although the May 2015 forecast provides more wiggle room for budget writers, none of the additional revenue called for in the outlook has come in the door to date. Business sentiment is fickle, and can sour overnight. With such a large amount of downside risk facing the near-term revenue outlook, well-stocked reserve funds are a must. Despite a few bad national indicators, it does not look as though the wheels are about to fall of the economic recovery anytime soon. If Oregon’s businesses and households are as confident about the future as they say they are, their combined hiring and spending should go a long way toward ensuring that their bullish expectations come true. Oregon’s population growth has accelerated in recent years and 2014’s growth ranked 13th fastest in the nation. Based on the current forecast, Oregon’s population will reach 4.35 million in the year 2022 with an annual rate of growth of 1.16 percent between 2014 and 2022. Such growth rates are below historical expansions when Oregon’s population regularly increased closer to 2 percent, or more. Oregon’s economic condition heavily influences the state’s population growth. Its economy determines the ability to retain the existing work force as well as attract job seekers from national and international labor markets. As the baby-boom generation ages into retirement, the relative share of the Oregon population in their prime working years will continue to shrink. This important demographic group will continue to grow in number, but as a share it will erode, placing downward pressure on economic and revenue growth rates moving forward.